Mallorca 167, 225 or 312? Home » Blog » Mallorca 167, 225 or 312? So with such high traffic to the place and nothing new to discover, is it worthy of a visit? In short, yes absolutely! 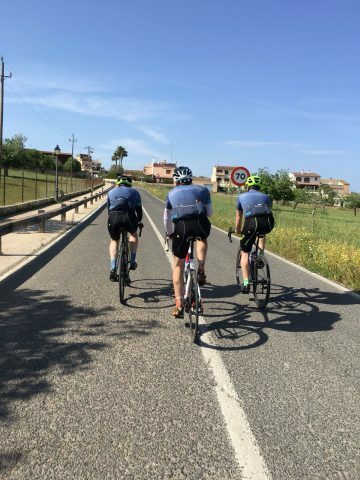 What better way to justify a trip over with the most beautiful of islands than the legendary Mallorca 312?! Firstly it should be noted that despite its name, 312 derives from one of three sportives available to do on the day. The 2019 event is set for Saturday 27th April. Falling at this time of the year, it offers the chance to set the season off with a bang. The International Cycletourist Tour of Mallorca aka ‘The Mallorca 312’ offers three routes: 167km, 225km and of course the 312km. With the course essentially being a huge loop through the northern half of the island, it offers an epic mix of terrain, with climbs predominantly appearing in the first half of the course and a generally flatter second. Though it’s name suggests there’s only one correct choice of event to do and this is something we’d challenge. Sure if you’re feeling up to it and the training over late winter early spring has set you up to do such an event, then don’t hold back. However, both the shorter routes offer beautiful routes in abundance and neither should leave anyone feeling short-changed. With it being so early season, few of us might feel ready for such a distance and that’s fine! Make your event the Mallorca 167, or Mallorca 225 and don’t force the 312 just for the sake of it. There’s plenty of routes to explore ahead of the event itself. Several that I could recommend include the cycle north east to Formentor, an active lighthouse built in 1863, situated 210 metres above sea level. Not being too far from Alcudia, the route offered a bit of climbing but not too big a distance ahead of the main event. 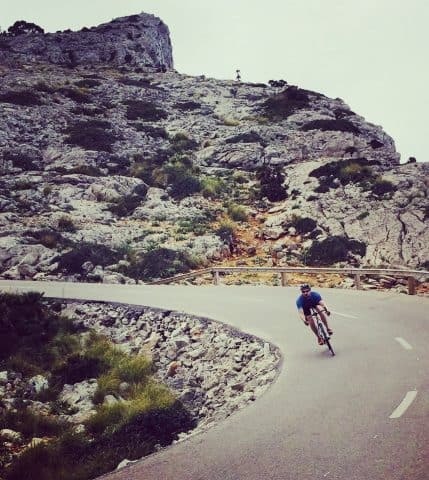 Perhaps the most famous of climbs is the Sa Calobra. Though well known, it doesn’t feature in the sportive route, due to the fact there is only one way up and down, writing itself out due to safety issues with descenders and climbers sharing the same road. We were fortunate to pick up our group entries ahead of everyone else, meaning the Friday before the event we could station ourselves at the Café right next to the entry pick up venue and watch every other poor cyclist queue patiently to get their race entries, whilst we saw off a beer or three. To those of you who joined us reading this, thanks for the positive feedback and we’ll look to do the same again. For some this isn’t so important, personally when a sportive moves from timed event to close road status, it becomes a whole different offering. Downhill segments become unique experiences and use of the whole road combined with no oncoming traffic allow you to go much faster. This event offers the only window to experience such incredible stretches of road in these conditions. This alone justifies the visit, financial spend and participation in this event. Approximately 6500 cyclists took part in the 9th edition of this sportive. 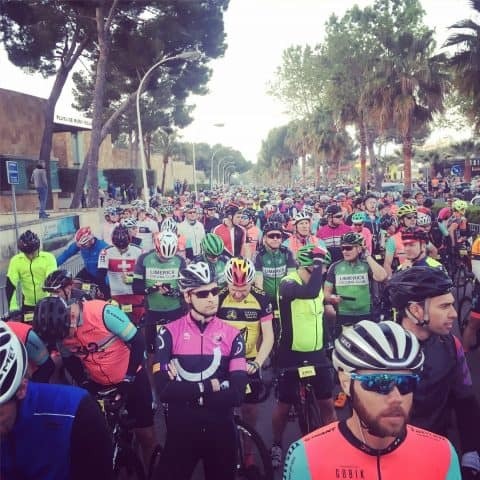 To me having a sizeable number of cyclists taking part creates incredible atmosphere, sufficient resource (generally) for the organisers to invest in adequate facilities, feed stations, toilets, signage etc. The number of cyclists is large, however not to the point where myself or anyone else in our group felt that traffic was impacting their experience. There are two start pens, forming two long corridors either side of the main road running through Playa de Muro, on the East Coast of the island. We found it easy enough to arrange a meeting point and say hi to fellow All Things Riders ahead of rolling into our start pens. Staying in Puerto Pollensa, Alcudia or Playa de Muro are all options over the weekend of the event. The ride down to the start was clear of traffic and easy to navigate. A stark contrast to many I’ve done before, where sign-posting, traffic and distance all play a role in how you feel, physically, mentally and emotionally ahead of the event. Though busy, there were rarely big queues to pick up snacks at the numerous feed stations. 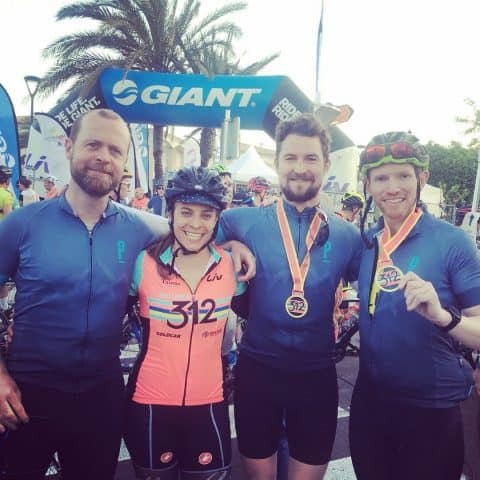 It of course goes without saying that going to the loo before you leave home is a good idea, as avoiding a last last minute visit makes for an easier, less stressful start to your sportive, whichever you’re doing. Riding in good company, I’ve learned to pick up the good habits I see around me. My top three, though obvious to many, are: 1) Laying out all your kit the night before a sportive, 2 )ensuring any bike maintenance is carried out a week or so before the event to allow for ironing out issues well before event day 3) Finally stocking up on buffer provisions to avoid the ‘bonk’ on the way around and not relying purely on feed stations for food throughout. Though there were options to do less, from the off we’d softly committed to doing the 312km event. Being honest, the kudos of completing a sportive of this distance would supersede Liege Bastogne Liege (see blog on this here) as the longest I’d completed. With over 5000m of elevation, this is a clear 1000m more than L’Etape du Tour (read more about this here). There are too many climbs to mention individually here and plenty of blogs offering all the stats and details on them should you wish to read more. Though they remain price prohibitive for many, some riders are fortunate to have power metres and feedback from all riders I know with one, is positive. I personally reference my heart rate regularly on sportives as it offers a similar means of tracking effort. Pacing myself around a course had never been a strength of mine, though with 312km ahead, I was at last forced to be conscious of how hard I was really working from the off. The simple act of monitoring heart rate at various effort levels in various ride conditions on training rides before the event, meant that I had a vague idea of what heart rate associated with what level of effort my body was giving the ride. Without going into FTP’s, heart rate zones and wattage, my habit in the first half of this event was dialing down effort around 10%. If I’d normally sit at 168bpm, I’d look to sit around 152bpm. It’s easy to let the surrounding pace of other riders dictate yours, particularly if you have a competitive gene within you! Too often I’m guilty of allowing this to happen. This time I made a point of being ok with people passing me on the climbs. This strategy paid off. Despite a total of 11 hours in the saddle, I managed to get round the course without bonking or hitting any kind of wall. This meant that I could choose how much to give it for the final 20km, as opposed to losing pace in the final half of an event, ‘fizzle-finishing’ like so often before. I also got to explore a huge number of kilometers across an island that doubtless could keep the intrepid cyclist busy for weeks if not months, despite its relatively small land mass. Will I be back? For sure! Am I done? Absolutely not. This is just the beginning. 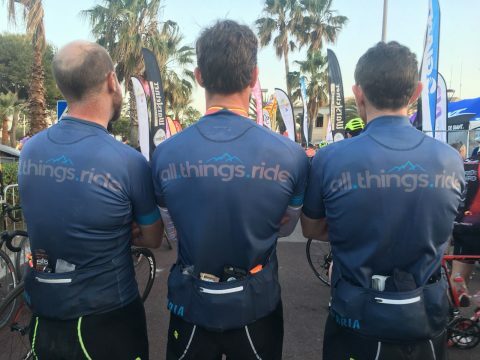 All Things Ride has a limited number of Mallorca 312 2019 packages are still available. Click here for more info.